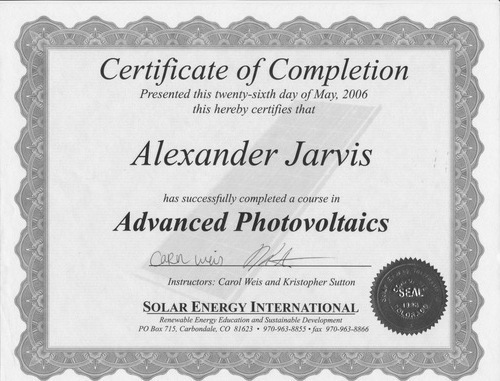 Alex Jarvis is a renewable energy professional since 2006. 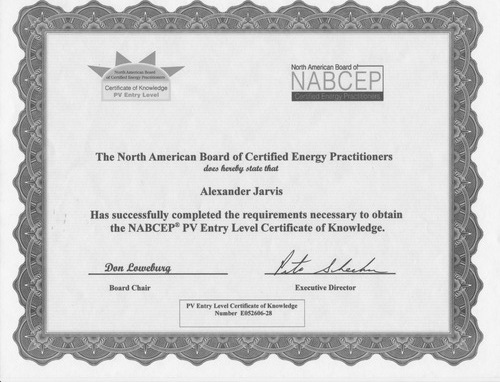 As a North American Board Certified Energy Practitioner (NABCEP) certified solar PV installer, Alex believes that compliance with the NEC is critical to all installations. Alex is a current board member of the midwest renewable energy association. is the technical editor of the 2010 Wiley published book, “PV Design and Installation for Dummies.” He and his company, Solar Systems of Indiana, Inc (www.solarsystemsofindiana.com) have installed or consulted on nearly 100 renewable energy systems across the midwest. Alex has led over 60 workshops/trainings logging over 1500 hours across the US for the Midwest Renewable Energy Association (MREA), Everblue Training Institute and Clean Edison. As a PV technical advisor for Purdue University, Alex helped guide Purdue's entry to a second place overall finish in the 2011 international Solar Decathlon competition held in Washington DC. Technical editor, "Photovoltaics Design and Installation for Dummies”, Wiley Publishing. Authored several renewable energy articles for the Ryder Magazine and The MREA newsletter.